The Uptown Theatre, which suffered extensive cosmetic damage in the Aug. 24 South Napa earthquake, is now repaired and ready to reopen. The Uptown Theatre, which suffered extensive cosmetic damage in the Aug. 24 South Napa earthquake, reopened Nov. 9 after a cleanup that included the repair of its ceiling mural by the same three artists who restored it before the theater's conversion to live performance in 2010. The historic Uptown Theatre in downtown Napa will reopen on Sunday, Nov. 9, after repairs corrected the extensive cosmetic damage caused by the south Napa earthquake on Aug. 24. The damage caused the Uptown to cancel five shows that had been scheduled for September and October. Now the Uptown is ready to open for its first show after the earthquake when reggae artist Ziggy Marley performs on Sunday, according to Shelby French, marketing director for the Uptown. Also scheduled to appear at the Uptown in November are comedian Dana Carvey and author and humorist David Sedaris. French said that all of the November shows are close to being sold out. This month the Uptown will also host screenings for the Napa Valley Film Festival, which takes place Nov. 12-16. The scheduled films include “Black or White” starring Kevin Costner, and a documentary film titled “I’ll Be Me” about musician Glen Campbell and his struggle with Alzheimer’s disease during his last tour in 2012. The Campbell documentary includes clips from the singer’s final performance of his long and storied career at the Uptown Theatre in Napa in 2012. Country legend Merle Haggard performs at the Uptown on Dec. 12, and blues guitarist Robert Cray on Dec. 13. The Beach Boys make their first appearance at the Uptown on Jan. 23. The Uptown Theatre opened in 1937 as a vaudeville-style movie house, complete with searchlights, banners and Hollywood stars. The Uptown became the place to see black and white films, as well as stars like Clark Gable and Carole Lombard who frequented the theater on their Northern California excursions. In 1945, Uptown was sold to a theater chain that transformed the theater to a four-screen movie theater. For many years, it was the only movie house in Napa showing the latest feature films. The theater closed its doors in 1989 but in 2000 was purchased by Napa developer and businessman George Altamura and a small group of investors. Altamura and his partners began a massive 10-year renovation project to turn the old movie theater into a live music venue that would recapture the glory and grandeur of one of Napa’s most historical landmarks. The theater reopened on May 14, 2010. During the renovation the theater underwent extensive retrofitting, which enabled it to withstand structural damage during the Aug. 24 earthquake, but the original detailed and period mural work on the ceiling was not spared. The original patterned ceiling and ornate mural over the stage had been painted over many times. During the restoration, a team of three professional artists and restoration specialists painstakingly retraced the original murals buried under the numerous coats of paint. After the earthquake damaged the ceiling and murals, the same artists returned to Napa from Los Angeles and Colorado to repair the damage. The team was led by Philip Slagter along with Pablo Sison and Jimi Viera of DropShop Studios, who work as set designers on TV and movie productions in Hollywood. The artists used the same stencils and photographs to recreate what they had originally restored just four years prior. “It was an honor to be part of the restoration of this beautiful old landmark four years ago and when we got the call from George (Altamura) we knew we had to come and make it right again,” Viera said. 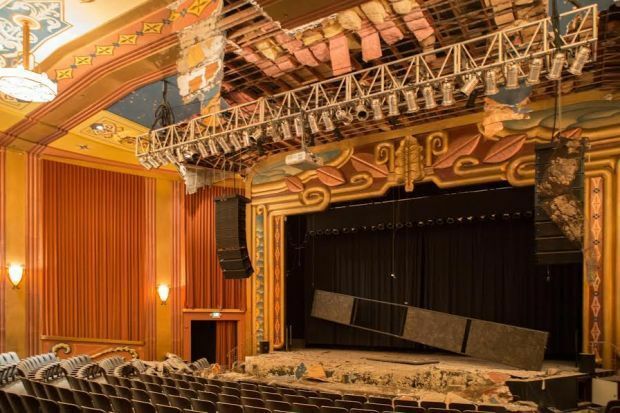 After the South Napa earthquake, cracks in the ceilings and walls were visible from the lobby through the theater to the stage. The mural and some plaster work also came loose along the expanse of the ceiling and the entire mural above the stage was severely damaged. The only option for conducting the repairs was to scaffold the entire interior of the theater so the artists could work easily and effectively. French said that more shows are currently being scheduled for 2015. When the shaking stopped, the Uptown Theatre still stood. Its mural did not. Attended the Ziggy Marley concert November 9 and the Uptown theatre looks GREAT! Had a very nice tour before the show from construction GM Matt Drew (Mr. Altamura's right hand man) and he showed us before and after fixes. we relaxed in the outside patio, and really enjoyed the sold out crowd rockin' and rolling to the Jamaican vibes:) Can't wait to return! Four screens or two whatever... didn't arrive until the late 70's....as it now is how it was until then.